Krypton in a discharge tube displays its green and orange spectral signature. Gaseous krypton is colorless, while solid krypton is white. Krypton is a member of the noble gas family (abundance 1.1 × 10-3%). It is obtained pure by fractional distillation of air. 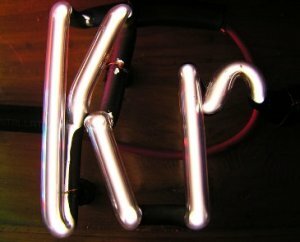 Krypton is used chiefly (with argon) in gas-discharge lamps, fluorescent lights, and electronic flash tubes. The isotope 86Kr has a spectral line used, from 1960 to 1983, as the standard measure of length. One meter is defined as 1,650,763.73 wavelengths of this line. Krypton-81, the shortest-lived isotope of krypton (half-life 13 seconds), and the shortest-lived isotope used in medicine, can be used to investigation the ventilation of the lungs. The patient breathes a small quantity of the gas, the arrival of which in different parts of the lungs is recorded by a gamma camera. This test is often performed as part of ventilation-perfusion scanning to look for pulmonary emboli. Krypton forms a limited range of chemical compounds and some clathrates. It combines with fluorine in an electric discharge to give krypton (II) fluoride (KrF2), a highly reactive, odorless crystalline solid, which decomposes slowly at 20°C, is hydrolyzed by water, and forms adducts with Lewis acid fluorides, e.g. KrF2·2SbF5. KrF2 is used as a strong fluorinating agent.